Gulfview - 1 Bedroom, 1 Bath exclusive condo. Easy walk to the beach. The Romantic “Gulfview” Condo offers a Spacious Master Suite, (sleeps up to 4) a Full Size Bath with Dual Sinks, Large Swimming Pool, 2 Hot Tubs, Tennis Courts, Sizeable Balcony, Full Size-Fully Equipped Kitchen, LCD TV, DVD-CD, Wi-Fi, and so much more! The limitless view from the “Gulfview” balcony condo includes Blue Oceans, Surrounding Inland Areas and Schlitterbahn Water Park; all within a walking distance of just three-minutes. The Master Suite of the “Gulfview” is a haven made for a King and Queens private retreat. 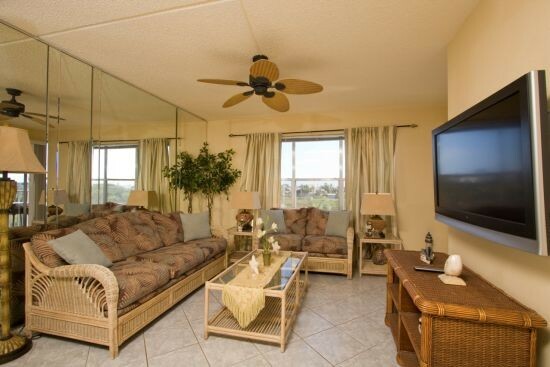 The “Gulfview” was recently-remodeled with new tile flooring, mirrored walls, and rattan furnishing. The sandy, earth tone colors are kissed with an Italian décor creating a romantic silhouette of vineyards and endless ocean waters. Surrender yourself to a Memory Vacation of Romance at the Gulfview! Take a minute to view our pictures and virtual tour of the “Gulfview”. You can make your reservations right here on line or contact the staff at South Padre Island Rentals for additional assistance. Our staff is available 7-days a week to make sure our vacationing guest always have what they need.